A blazar is a galaxy with an intensely bright central nucleus containing a supermassive black hole, much like a quasar. The difference is that a blazar can emit light with extremely high energy gamma rays that are sometimes over a hundred million times more energetic than the highest energy X-rays that the Chandra X-ray Observatory studies. The overall emission of a blazar also varies dramatically with time and all known blazars are bright at radio wavelengths. Astronomers suspect that the bizarre behavior of blazars results when matter falling onto the vicinity of the supermassive black hole erupts into powerful, narrow beams of high velocity charged particles. The intense X-ray, gamma ray, and infrared emission we see, and the variability as well, are thought to be the results of our fortuitously staring right down the throats of the jets. In most other galaxies, infrared radiation comes from dust heated either by star formation or ultraviolet radiation from the vicinity of the massive black hole, rather than a blazar jet. CfA astronomers Allesandro Paggi, Raffaele D’Abrusco, Jonathan Grindlay, and Howard Smith, and their colleagues recently published a new method to find and study blazars. They discovered that the infrared colors of blazars, as measured by the recent WISE survey satellite, are so unusual that objects with these colors are very likely to be blazars. Ninety-seven percent of known blazars were easily picked out from thousands of other WISE sources by their infrared colors. There are about 1873 known gamma ray sources. About one-third of them are quite mysterious, in part because their very imprecise spatial locations have not allowed them to be associated with particular galaxies that can be studied with optical telescopes. The CfA astronomers discovered that about half of unknown gamma-ray sources could reasonably be identified with infrared emitting blazars, with the far more precise WISE coordinates then allowing detailed follow-up observations. One unidentified gamma-ray source recently flared, prompting the team to see if it too had an infrared blazar-like color counterpart consistent with its location. Indeed there was one. The mystery, however, is that the counterpart is not a known blazar, nor does it have typical blazar properties despite having typical blazar infrared colors: it has no radio emission, it is not known to vary, and although it is an X-ray emitter, the rest of its broad distribution of energy is unlike that of most blazars. 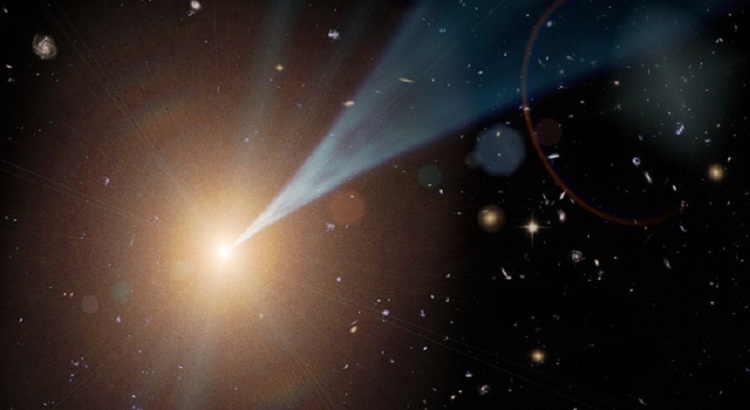 It is possible that another galaxy nearby is actually the gamma-ray counterpart, but all of the candidates show other discrepancies inconsistent with blazar behavior. If the WISE source is in fact the counterpart to the gamma-ray burst, the absence of radio emission means that it represents a mysterious new class of extragalactic source that somehow suppresses radio emission. If it is not the counterpart, its lack of radio emission is still a blazar mystery. Further research is needed to resolve the mystery, but the work so far illustrates the powerful capabilities of multi-wavelength research.